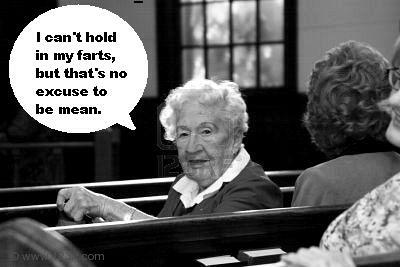 Home → Damien Zone → Long Valley, NJ church-goer asked to leave church because of her flatulence. 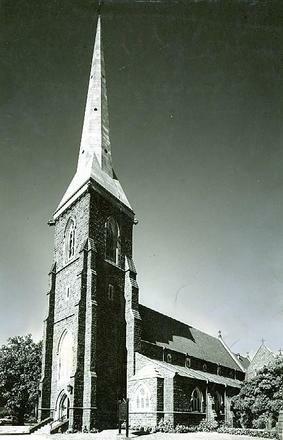 “All I know was that I was asked to leave,” said Bessy Denker 91, the eldest member of the Long Valley, New Jersey Anglican Church of the Conception. It seems that the very churchy crowd at Bessy’s church were not happy with her inability to hold in her flatulence during services. Despite being asked many times to attend services by standing in the back hall, Bessy has defied the other members of the congregation and sits wherever she pleases. Denker has hired Denville attorney, Jayson Seaboard, to represent her. While he has handled similar cases for people who have been barred from their workplace because of intestinal gas, this is his first time representing against a church. “Passing gas or farting at work has always been easily remedied,” said Seaboard from the crowded waiting room of his office where all the windows were wide open. “If a person has gas problems in the workplace, it’s often just a matter of relocating that person to a remote office or sometimes letting them work from home. TheDamienZone thought that he said “Dooty-ronomy” and we almost laughed, but we managed to get a counterpoint from the Vicar before laughing out loud at our own childish uncouthness. Other people in the congregation had similar sentiments. Seaboard has scheduled a hearing before the county judge on November 20, and up until then, Bessy Denker must be allowed to attend the church that is trying to give her the boot. “We call her pew, the P.U. pew,” said Mona Breedlove, 59, of Long Valley. “I sit as far away as I can but sometimes during the sermon I can not only hear the faint tooting sound, I can smell it too. Of course it takes the odor about a minute or two to get to me, but when it does — it stinks! out. I truly do take pleasure in writing but it just seems like the first 10 to 15 minutes are generally lost just trying to figure out how to begin. I don’t think about it or clear my head — I just do it. It’s a talent and if you don’t have the talent, you’ll never acquire it — doesn’t mean you’re a bad person. But, however, when you try to sneak a link into a comment and your comment is a phony, I know either trash it or edit it — see? EDITOR’S NOTE — 99% of spam gets culled automatically, but for you other bloggers, note the way this comment is written — note the complimentary nature of it. It stinks of a spam scam. Very rarely oes a comment have praise included in the text — yuk !